was born in Michigan to parents who gave me a life-long love of books and the confidence to make my dreams a reality. My earliest memories are of my mother or father reading fairy tales to me.One day my dad discovered that I knew all the words on the page. From then on, I was able to read to myself. Whenever I chose, I could slip away to an enchanted world populated by talking rabbits, mythical creatures like Pegasus, and heroic dogs. My favorite books, then, were set in the old west or had animal characters, usually dogs. As I grew older, my interests settled on the mystery genre. Take a walk through Foxglove Corners and look at my cozy mystery series. I continued to read whenever I could, enjoying all the girls' mystery series, like Nancy Drew. I began to view the objects in my world as grist for my own mystery mill and wrote stories in pencil, filling dime store composition books and keeping scrapbooks with pictures clipped from magazines. Soon I was reading adult novels like Gone with the Wind. I discovered a passion for history, especially the Civil War years. My father, a native of Louisiana, instilled in me an appreciation for my Southern heritage. Gradually, my writing attempts grew more serious. 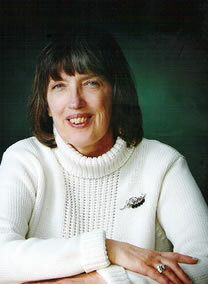 From Phyllis A. Whitney's books on writing, I learned the value of keeping a plot notebook. When I was sixteen, with savings from a summer job as a soda fountain clerk, I bought a Royal portable typewriter. That fall I wrote my first book, the adventures of a girl reporter who traveled to the planet Venus to solve a mystery. She was a combination of Judy Bolton and Beverly Gray, and my Venus resembled the worlds described by Ray Bradbury in his stories, heavy on atmosphere, light on science. After graduating from high school, I worked as a stenographer for Chrysler Corporation for several years, two of them in Italy. While abroad, I toured Italy on weekends and vacationed in France, Germany, Austria, Switzerland, and England, collecting ideas for settings and stories in my notebook, along with souvenirs and memories. Back home in Michigan, I attended Oakland University in Rochester, majoring in English. Around this time I discovered the Gothic novel. Between classes, I used to read paperback novels by Victoria Holt and Virginia Coffman. At Oakland the professors gave me a strong grounding in English and American literature, including the history of the Gothic novel. I was ready to share my knowledge. I began teaching high school. In the evenings and during the summers I took classes to earn a Master's degree in English literature. 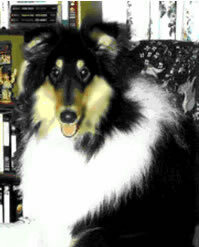 During this time I also bought my first black collie, Heather. It seemed as if all my dreams had come true except for one. I wanted to have my own work published. One summer, I wrote my first serious book, an historical romance with a western setting and strong Gothic element, Treasure at Trail's End. Eventually I left teaching and began to write full time. Gothics had long since gone out of favor, but I discovered several books about female sleuths and their dogs, so I decided to start a series of my own with my collie, Holly, as a character. An hour's drive from my home, in Lapeer County, I found the perfect setting - The Foxglove Corners, aka Metamora - and began writing. Two critiques and twenty-eight submissions later, Darkness at Foxglove Corners found a home at Five Star. In the meantime, I joined Sisters in Crime, Guppies and the GothRom Chapter of Romance Writers of America where I found a group of writers who share my passion for Gothic novels. I also discovered the Sisters in Crime Internet Workshop and another group of friends who helped me polish my chapters. Throughout my life, I've been blessed with a strong and giving support group of family and friends whose help has been invaluable to my writing career. Today I've made a change in my professional life. I no longer belong to Romance Writers of America, which means that I had to leave the Gothic Writers and the Kiss of Death Chapters. I didn't renew my membership because I realized that it wasn't helping me since I don't travel to conferences. I'm still with Sisters in Crime, though, and I still have the critique partners who've helped me from the early days of my career. Now I rely solely on online promotion with my publicist at Coffeetime Romance and on my newsletter. I don't attend book signings, but several of my readers order books directly from me. My manuscripts have been accepted for publication rather quickly now for which I'm grateful, remembering those twenty-eight submissions for Darkness At Foxglove Corners before it was accepted. I have a happy relationship with my publishers, Wings ePress and Hilliard and Harris. Occasionally I remember all the years Treasure At Trail's End stayed on a closet shelf until I had the idea to revise and market it. Many readers have told me that this is their favorite of my books. These days Holly is a cherished memory. I live with my sable collie, Wolf Manor Kinder Brightstar who is exceptionally smart and can be very naughty and very sweet. She's stopped chewing my twenty dollars bills when I keep them out of her way but is constantly looking for other mischief to make. I've added a laptop and replaced my original computer, but I've never even thought about recycling my old Royal portable. Today I live in Michigan. My portable typewriter is in the basement, replaced by a computer, and I'm surrounded by all the books I've loved through the years, now joined by others with my name on the cover. What more could a writer want?